iDETECT is a comprehensive, easy-to-use system designed to assess mild traumatic brain injury in athletics and the military. 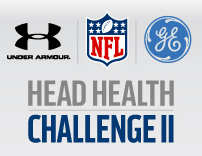 The National Football League (NFL), GE, and Under Armour have selected a team of physicians and engineers from Emory University and the Georgia Institute of Technology as winners of the Head Health Challenge II, a competition for new innovations intended to speed diagnosis and improve treatment for concussions. The Atlanta-based team was awarded for development of iDETECT (integrated Display Enhanced TEsting for Cognitive Impairment and mTBI), a rapidly deployable, easily administered, comprehensive system designed to improve neurologic assessment following mild traumatic brain injury, such as concussion sustained in athletic events and military conflict. A total of seven winners of the Head Health Challenge II were selected from more than 500 submissions from 19 countries. Each team will receive $500,000, and will also have the opportunity to receive an additional $1 million to advance their work to better protect against brain injury. The Emory-Georgia Tech team and iDETECT are showcased in an online video. iDETECT addresses feasibility and reliability drawbacks associated with current concussion screening tools. 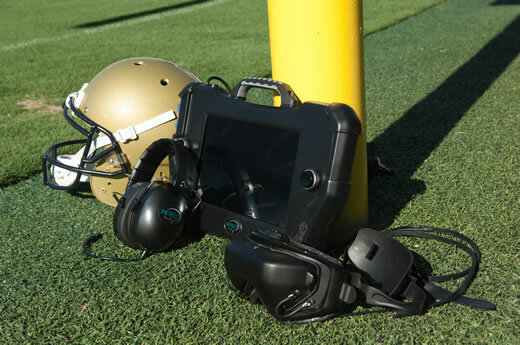 It is an easy-to-administer, portable, and immersive system that integrates multiple concussion tests within one platform. The next generation iDETECT system will be further tested in a clinical study comparing iDETECT outcomes against other traditional separate mTBI screening tools. "Our team is excited and honored to be selected as a winner in the NFL-GE-UA Head Health Challenge II competition," says Tamara Espinoza, MD, MPH, assistant professor of emergency medicine at Emory University School of Medicine and principal investigator of the Head Health Challenge award. "A tremendous amount of research and effort has gone into the development of iDETECT, and we believe it may become an essential tool in assessing sports-related concussion." Of the 1.7 million traumatic brain injuries in the United States each year, more than 750,000 are considered "mild," and over 173,000 are related to recreational and sports activity. In the last decade, emergency department visits for mild traumatic brain injury (mTBI) among highly vulnerable populations, such as children and developing youth, have increased by more than 60 percent. "Adequately assessing mTBI using individual, single-pathway screening methods is extremely difficult, given the complexities of neurologic injury," says Shean Phelps, MD, MPH, principal research scientist at Georgia Tech Research Institute (GTRI). "With this additional funding from the Head Health Challenge II, our team can more fully pursue the long-term vision of iDETECT as a multi-modal device that addresses sports-related, mild traumatic brain injury." The DETECT project was the brainchild of David Wright, MD, director of Emergency Neurosciences at Emory University School of Medicine and Michelle LaPlaca, PhD, associate professor of biomedical engineering at Georgia Tech and Emory University. In 2011, the project evolved from a single neurocognitive approach for detection of concussions to an extended, multi-modal platform when the partnership broadened to include the Georgia Tech Research Institute. GTRI added critical systems engineering, human factors and military medical operational expertise. "Mild traumatic brain injuries in youth, college and professional sports have the potential for life-changing, long-term consequences," says Wright. "The iDETECT system integrates multiple concussion testing capabilities within one platform and allows rapid and reliable assessment at the location where the injury occurred." This comprehensive approach enhances the ability to validate the on-field assessment platform and more accurately screen for traumatic injury. Phelps, a retired U.S. Army lieutenant colonel adds, "mTBI assessments in the military is an area that needs new approaches such as those provided by iDETECT." Partner institutions forming the iDETECT team include Emory University, Georgia Institute of Technology, the Georgia Tech Research Institute (GTRI) and the University of Rochester. The Department of Defense and the Wallace H. Coulter Foundation provided financial support for development of iDETECT. In addition to Espinoza, Wright, LaPlaca and Phelps, team members include Brian Liu, GTRI research engineer; Stephen Smith, GTRI research engineer, Russell Gore, MD, sports neurologist; John Brumfield, biomedical engineer; Jeff Bazarian, MD, associate professor of emergency medicine, University of Rochester; and Courtney Crooks, PhD, GTRI senior research scientist.